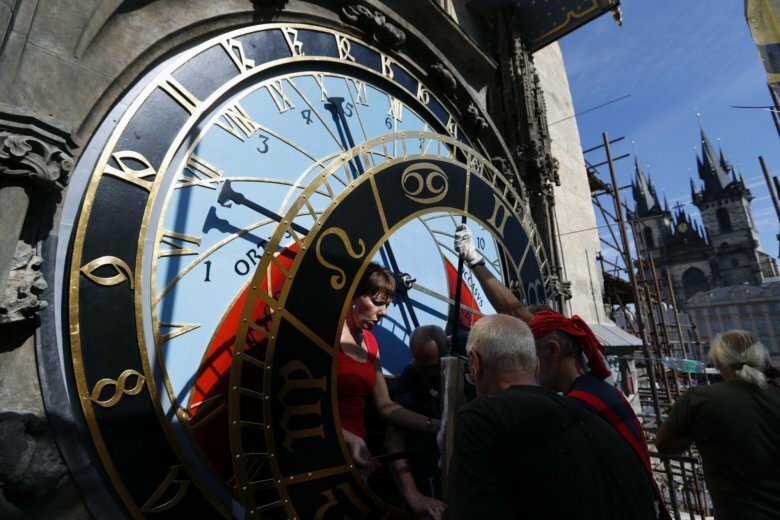 PRAGUE (AP) — Prague’s fabled astronomical clock is returning to the Czech capital’s picturesque Old Town Square after a complex repair operation restored the medieval landmark to its former glory. The 608-year-old clock, a must-see for many tourists with its hourly moving display of the 12 apostles and other figures, was removed in January for its first major repair since World War II. The clock, believed installed in the City Hall’s tower in 1410, is unique because it still has its original mechanism. A major addition came in the 18th century, when the apostles were introduced. Clock master Petr Skala said they were believed to be installed in 1723, during the reign of Holy Roman Emperor Charles VI. The latest version of the round calendar board — which includes all 365 days of the year, the zodiac signs, the symbols of the 12 months and Prague’s coat of arms — was created by Czech artist Josef Manes in 1866. As a center of the uprising against the Nazi occupying forces in the last days of WWII, Prague’s City Hall was a site of fierce battles. Parts of it were irreparably destroyed, and the clock tower was badly damaged during a devastating fire on May 8, 1945. Skala said the latest restoration efforts aim to comprehensively fix a series of poorly done repairs, mostly from the 20th century. As the clock has undergone numerous changes since 1410, Skala said the point was not to give it its original, 15th-century look. He said his main task was to make sure the clock’s mechanism was as reliable as possible in the future. As part of the process, his wife Melanie cleaned every single part of it, removing old paints and rust, washing them all in citric acid five times. Metal chains installed after the war were replaced by drums with hemp ropes in the clock’s drive, its former feature. “Chances are it will be functioning for another 600 years,” Skala said. Among the more visible changes are a new version of the clock’s 19th-century calendar board, and a new lick of paint for the elaborate astrolabe and the figures. Two tin windows were removed, replaced with new ones made of stained glass in place since the early 20th century. L.Hainz, a company that has taken part in various repairs of the clock since the 1860s. was involved in the works, ensuring continuity. The clock has given rise to some legends and superstitions — including a belief that the entire nation will suffer when it stops running. Another legend might be reason for concern for Skala: anyone who changes the clock or tampers with it will go mad, or die. Some believed that the clock foretold the record flooding that hit Prague and large parts of the Czech Republic in 2002, when it briefly stopped working shortly before midnight on New Year’s Eve 2001. Officials, however, said it was due to a minor malfunction.